Eleven-year-old Betty doesn’t know she’s going to grow up to be a famous civil rights activist. All she knows is that when she’s in church, listening to speakers like Paul Robeson and Thurgood Marshall, the world makes much more sense. 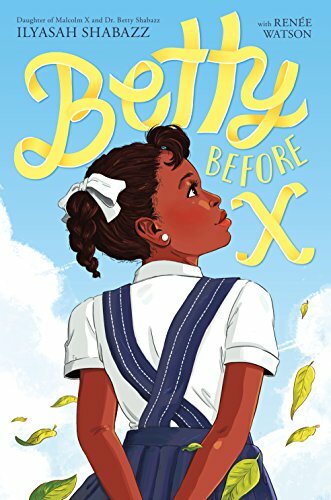 Life is not easy for a Black girl in 1940s Detroit, and Betty struggles to find a sense of self in a world where she’s always second-best because of the color of her skin. Suspicious that even her own mother didn’t really want her, Betty slowly finds her own voice through the voices of people speaking up for social justice. Ilyasah Shabazz wrote this book about four formative years in her mother’s life, when the woman who would become Dr. Betty Shabazz was still Betty Dean Sanders at the very beginning of the civil rights movement that would define so much of the middle of the 20th century in the United States. Shabazz gently fictionalizes her mother’s story to create a cohesive narrative, so this book might not line up point for point with a more mature biography of Shabazz — what it does, and does particularly well, is capture the spirit of a girl who grew up feeling less-than and not-quite-good-enough who realizes that no one should ever have to feel that way because of the color of her skin. It’s especially interesting to read about the Housewives’ League, a civil rights organization created by a woman to boycott businesses that didn’t hire Black people. People may not respond to arguments about right and wrong, but they pay attention when you “hurt them in their pocket,” the organizer Mrs. Malloy explains to young Betty. When we’re studying civil rights, it’s easy to get swept up in the big national moments (the Montgomery bus boycotts, the march on Washington), but small, unsung communities of people were fighting the same fight in cities and towns across the United States. It’s also nice that Shabazz paints a nuanced picture of what Black Americans wanted civil rights to look like — they didn’t all have the same vision, and as Betty listens to arguments and discussions she’s a little too young to completely understand yet, we can appreciate how complicated confronting systemic racism can be. It’s not hard to make connections between those conversations and some of the discussions happening on Facebook and Twitter today. Ultimately, this is a lovely coming of age story about a girl who would become a key player in the civil rights movement, both before and after her husband Malcolm X was assassinated.